Albert E. Cowdrey. The Posthumous Man. Cowdrey takes us once again to New Orleans. Wentworth is an antiques dealer, specialising in Funerary Arts. An old tombstone behind which is a murderous tale comes his way, bringing bad fortune to him. A far-future postmodern couple in deep space come across an ancient planet which suceeds in driving a wedge between them. A fierce battle is fought out on the planet, and there is a chance for the couple to be reunited. Only the second story from Rosenbaum, and this promises a lot for the future – if I had read this without the author’s name provided, I would have been thinking of people like Robert Reed or Jim Kelly as the writer. A group of elderly residents of a nursing home pool their resources, and their constitutional rights, to constitute a ‘geropod’ – a multi-body collective. Between them they manage to chase some similarly aged and inclined senior babes, and seek revenge on a son-in-law, in an enjoyable romp. Chris Willrich. King Rainjoy’s Tears. A follow-up to ‘The Thief with Two Deaths’ (F&SF June 2000), which introduced the poet Persimmon Gaunt and Imago Bone. The duo are searching for the king’s tears, which have taken human form, and without which he cannot feel compassion and can not wed his intended. Some nice moments, in particular the model ships in bottles, which are more than simply models. But Bone’s Spiderman like climbing qualities don’t quite ring true, and having a King, a Quest, a Wizard, and Poetry, in one short story is a bit too much for me! Thomas M Disch. The Flaneurs of Mars. A story-ette in which the need for religious belief is pondered by godheads. Robert Loy. You Can’t Get Turnip Juice out of an Aorta. A very old vampire is finding life a chore, what with his body and faculties crumbling but not dying. A chance encounter with a vegetarian gives him renewed vigour, and the vegetarian finds he has a hunger for something more substantial than quorn. R. Garcia y Robertson. Princess Arial. Another follow-up to stories previously in F&SF. The story starts well, with a non-standard female lead in a harem, facing threats from several sources. The finale, with hidden doors, dwarf-chutes, and godesses arriving on mythical beasts, is somewhat more cod-fantasy than I like. 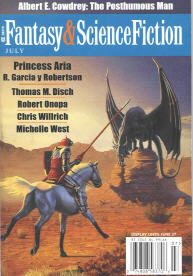 With the two lengthy stories being fantasy, it is fortunate for those looking primarily for SF (like me) that both the Rosenbaum and Onopa SF stories are such good ones. The cover illustration shows just how difficult it can be to draw a running horse (and the rider seems to have no neck).